As I stated in my American League post, choosing the Most Valuable Player from each league is the most difficult decision of all the major baseball awards handed out at the conclusion of each season. With Rookie of the Year and Cy Young you can usually look solely at which player had the best overall stats, but Most Valuable Player sometimes involves a bit more than just stats. While it’s important that an MVP winner had a great statistical year, the best offensive player doesn’t automatically become the most valuable. With that said, it was an even more difficult vote for me this season than it has been in seasons past. Daniel Murphy, Joey Votto, Kris Bryant, Nolan Arenado and Anthony Rizzo were all extremely valuable members of their given team in the National League. However, in the end, only one player can win the Most Valuable Player award. Joey Votto had a somewhat under-the-radar superstar season, after getting off to a horribly slow start. When all was said and done this season, Votto wound up hitting .326 with 29 home runs and a .440 OBP. Playing for a sparsely talented Reds club, it’s easy for Votto to get overlooked, but he was in fact very valuable. Equally as valuable was Daniel Murphy. This season for the Nationals, Murphy hit a staggering .347, virtually getting a hit every night. Also hitting a career high 25 homers to go along with 104 RBI’s, the year Murphy had is certainly one to remember, but not one to award with the MVP. One of the brightest stars in baseball at the moment, Anthony Rizzo, also placed in the running for MVP in the National League. With his 32 homers and .385 OBP, Rizzo helped propel the Cubs to the postseason for the second straight season. But regardless, the numbers simply aren’t there for him to win the award. 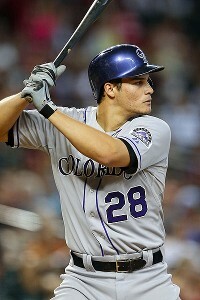 Once again, I made the very difficult decision of placing Nolan Arenado as runner up in the voting for MVP. Despite him having hit 41 homers with a mammoth 133 RBI’s on the season, I find it hard to give him my vote. Even so, there should be nothing taken away from the season he had. Arenado is in a class all his own. With the second-place finish of Nolan Arenado, that leaves Kris Bryant on top for the Most Valuable Player in all of the National League. Although he recorded 31 fewer runs batted in than Arenado on the year, his performance day in and day out, including two five-for-five performances, helped cement the Cubs with the best record in all of baseball, subsequently giving Bryant the edge in the MVP voting. With that said, it was an even more difficult vote for me this season than it has been in seasons past. Jake Arrieta, Nolan Arenado and Bryce Harper were all extremely valuable members of their given team in the National League. However, in the end, only one player can win the Most Valuable Player award. Nolan Arenado had one of the best all around seasons in baseball this year, but to me it wasn’t the most valuable. But that’s not to take away anything from the year he had. With a .287 average, 42 home runs and major league best 130 runs batted in, Arenado broke out as one of the best third basemen in all of baseball. If he can keep producing the same type of numbers, he’ll eventually take home an MVP. However, that’s not going to happen in 2015. Coming down to Jake Arrieta and Bryce Harper for National League MVP, it’s truly a tough choice. Comparing a pitcher and hitter is never easy, but in this case it has to be done. With that said, I ended up placing Arrieta as the runner up. While I don’t necessarily think a pitcher should never win the MVP, given they aren’t an everyday impact, I tend to give hitters a slight edge. But Arrieta truly came as close as you can to winning the NL MVP without holding the stats to take home the award. With a second half ERA of 0.75, Arrieta played an immense role in propelling the Cubs into the playoffs for the first time since 2008, but he doesn’t quite get my vote. Bryce Harper is in fact the player I went with for the National League Most Valuable Player award for 2015. Although the Nationals unbelievably missed out on the postseason, Harper did all he could to get them there. With one of the top seasons in the history of baseball for a player age 22 or younger, Harper will continue to win MVP awards if he can continue to post numbers like he did this season. 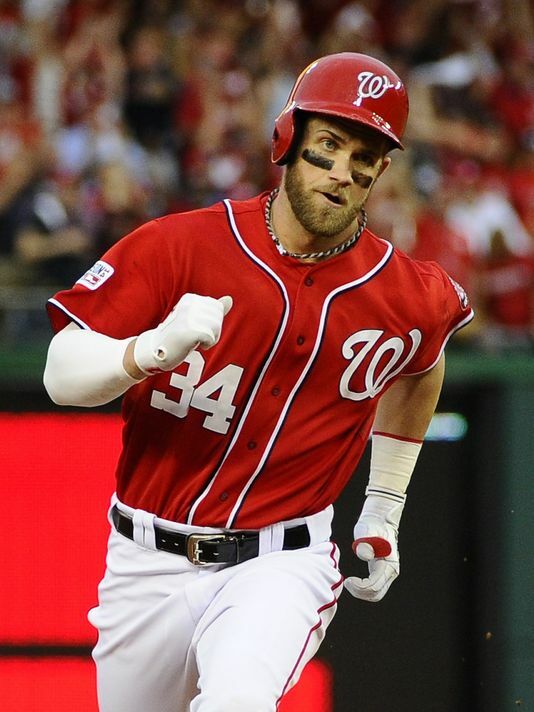 With 42 homers, a .330 average and a .460 on base percentage (due in large part to his 124 walks), Harper should pick up his first MVP of what will likely become many. Tallying yet another hit on Thursday night against the Rangers, Nolan Arenado pushed his average for the season up to .322, but more importantly extended his league-leading hitting streak up to a respectable 28 straight games. That puts him first in Rockies’ history in terms of consecutive games with a hit, surpassing Michael Cuddyer’s mark of 27 games, which he set last season. Sitting halfway from Joe DiMaggio’s all-time hitting streak record of 56 games, it’s far too early to begin talking about Arenado charging past, arguably, the most impressive baseball record of them all — one that many people believe will never be beaten. (If it were to happen, Arenado’s 57th straight game with a hit would come on June 11th in Atlanta). Nonetheless, what Arenado has been able to do over the past month or so — getting at least one hit in every game since April 9th — has been nothing short of remarkable. But hitting streak aside, at just 23 years old, Arenado is quickly earning the recognition and respect that he deserves as one of the top young players in the game today. After becoming just the tenth rookie to ever win a Gold Glove award, for his defense at third base in 2013 that rivals nearly every other infielder in all of baseball, Arenado is on his way to becoming a full on superstar. And therefore, if you aren’t familiar with Nolan Arenado — perhaps you hadn’t ever heard of him until reading this post? — start paying close attention. Arenado is an extremely exciting player, and from what he’s been able to accomplish so far in his young career, the future would appear to be bright for Arenado (and the resurging Colorado Rockies) moving forward.